Timber New Zealand Kauri, Cedar, S Glass and Kevlar construction. 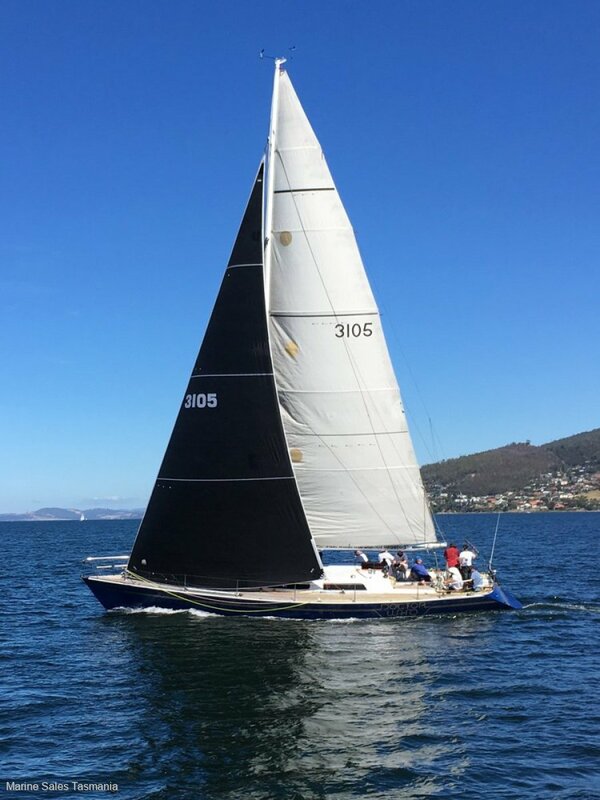 ## NOW REDUCED - VENDOR KEEN TO NEGOTIATE A SALE ## "Doctor Who" is located in Hobart Tasmania and is arguably one of the most beautiful ocean racing yachts on the water in Australia. Designed by internationally renowned Laurie Davidson of New Zealand. Proven Offshore performance is supported by a very low IRC Rating of 1.143 She holds a record of 5 Top Ten Sydney-Hobart Handicap placings including being the overall IMS Winner in 1990 and captured the record for the Best Corrected Time, across all handicaps in the history of the race in a time of 2 Days 10 Hours & 6 Minutes. The Dark Blue Topsides where professionally re-sprayed in 2008 and look fantastic. The Interior Varnish renewed in 2010. We have 94 detailed photos on hand for this listing which can be emailed as medium resolution images in one megabyte files or alternatively request a CD to be posted with all high resolution images. "Doctor Who" (formerly "Doctor Dan"). Fin Lead Keel. Balanced Spade Rudder. Hobart Tasmania - Ryct Marina In Sandy Bay. Laurie Davidson of New Zealand. Laid Teak over Marine Ply. Bukh DV48SME 48hp 3 Cylinder Turbo Diesel with Sail-drive and a 2 Blade Folding Propeller. Cruise at 6.5-7 Knots with top speed 8 Knots. Wheel Steering with S/S Wire Cable to Quadrant. Engine room: Under the companionway steps with good access from front and sides. 700L in 2 S/S Tanks. Stern. Mainsail. Full Deck Cover from Mast to Stern. Wheel. Awning. Total Berths 11 - Forward Cabin has a Single & Double Berth with Headroom 1.9m - Main Cabin has 4 Singles with Headroom 1.98m - 2 Double Berth Aft Cabins with Headroom 1.87m. Headroom at Galley 1.98m, Forward Bathroom 1.87m & Aft Port Bathroom 1.83m. In Forward Bathroom but disconnected. 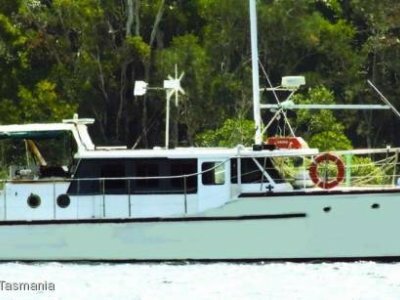 Spacious Forward Starboard Bathroom with S/S Vanity & Manual Toilet. Portside Aft Cabin Ensuite with Manual Toilet & Vanity. S/S Sink with Pressurised & Hand Pumped Cold Water. Mariner Princess LPG 2 Burner Stove with Oven. S/S Top Loading Eutectic Fridge & Freezer. Wilkie Electric Anchor Winch. Danforth Anchor with Chain & Warp. Plough Anchor with Chain & Warp. 10 Person Hard-pack Roaring Forties Liferaft Serial#383 New 08/94 Last Serviced 24/11/07 (out of service). Emergency Tiller. 2 Manual & One Electric Bilge Pumps. LPG Gas Detector. 3 Fire Extinguishers. EPIRB. 2 Horse-shoe Life-rings. Danbuoy. 12V System with 3 x 12V Batteries. Marinetics Circuit Breaker Switchboard. Multi Battery Switch. Bukh Alarms, Hours, RPM, Temp Gauge & Turbo Pressure. GME GX600 VHF Radio. ICOM Hand-held VHF Radio. Garmin GPS128. Testoterm Quartz Digi Thermometer. Clarion CD Radio Stereo. Brookes & Gatehouse (B&G) Hercules 2 System 290 for Depth, Boat Speed, Wind & Compass. 6 B&G Displays in the cockpit. 2 B&G JR284 Displays at the mast base. Danforth Constellation Pedestal Compass. Nav Lights. Clock & Barometer. 2018 New No1 and No3. Full Sail Inventory with the newer ones by Doyles. Fully Battened Mainsail with Rope Cord Luff. 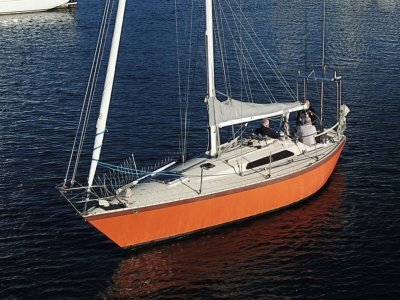 Allspar 7/8th (Re-Painted & Serviced in 2008) Alloy Mast Keel Stepped with 3 In-line Spreaders and Double Runners. Painted Alloy Boom, Spinnaker & Jockey Pole. S/S Wire Rigging New in 2000. Twin Groove Gemini Head-foil. New 2010 Main Cabin Windows & Surrounds. 2 x Lewmar 65s Three Speed Primary Winches. 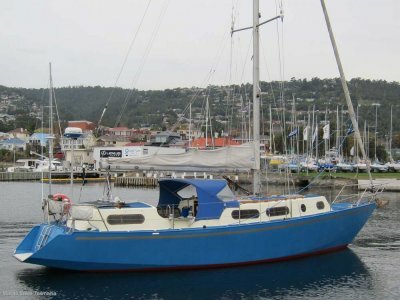 2 x Lewmar 48s Two Spinnaker Sheet Winches. 2 Lewmar 42s Two Speed Runner Winches. 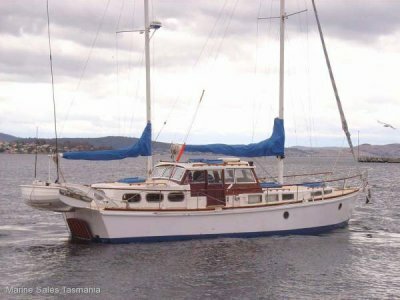 2 Lewmar 30s Self Tailing Mainsheet Winches. 2 Lewmar 12s Self Tailing Halyard Winches. Navtec Hydraulic Backstay & Runner Fine Tune. Mooring Lines & Fenders. AMSA Registered Ship 851735. Sail Number 3105. Wet Sanded, Antifouled and Polished Annually and in very good racing condition.